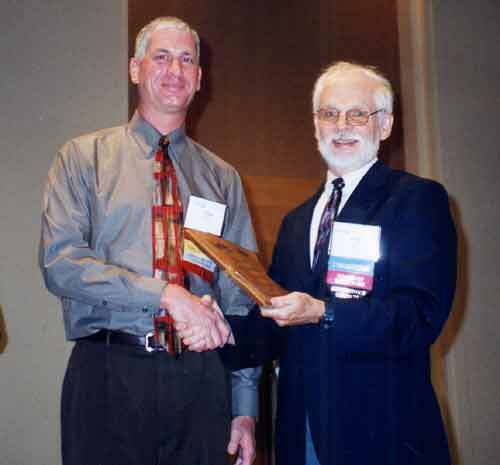 Alan Laumeyer is a leader in his enthusiasm and effort supporting the GIS community in Minnesota. He has been treasurer of the GIS/LIS Consortium from 1995 to 2005 and is one of the active members of the Consortium. As a member of the Scholarship Committee, he led the effort to research and implement policies that maximize financial benefits to benefactors and student recipients. As a member of the Executive Committee, he visioned the value of a management firm to help the Consortium fulfill its mission, developed the proposal, and helped select the consulting firm to that work. As a member of seven Conference Committees he has provided guidance and helped arrange for some of our best keynote speakers. Work experience in the Minnesota GIS community includes emergency address consulting, utility data analysis and county government data analysis along with coordination of the county user group. Whenever we need a presence at a GIS event or meeting of other GIS-related group, he is there.